Friday afternoon and I was on the verge of contacting Matthew Piper to see if he wanted to chase on Saturday when he beat me to it. 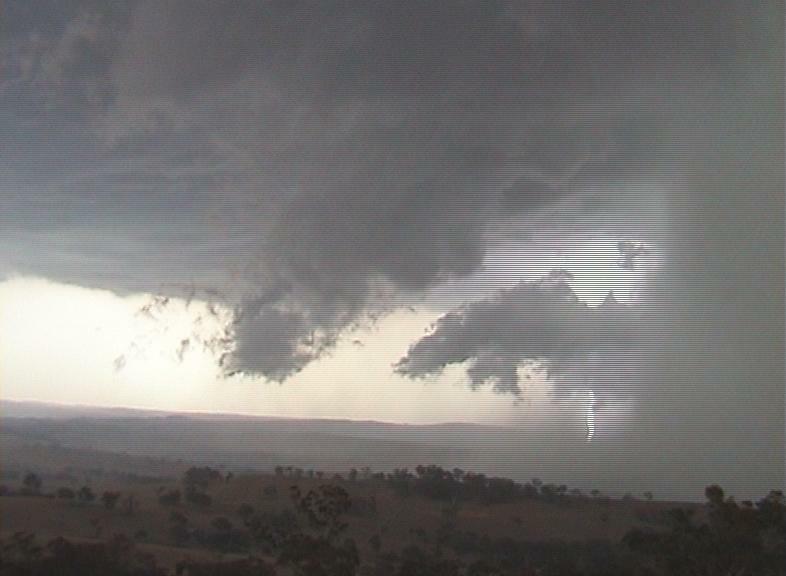 AVN was showing a nice area of high CAPE and L/I over the Central Tablelands from Mudgee south to Oberon. We both had severe withdrawals (SDS) and need a thundery fix. Next morning after picking up Matt at 10:30, we were on our way. After stopping for food at Lithgow we headed west. We decided to head up Mudgee road first. I was thinking that the best area would probably be on the Northern side of the predicted target area towards Mudgee. At Capertee we stopped and watched the first towers start to go up on the trough line that was positioned around Orange in a NNW to SSE line. After 15 minutes we decided to head north to Ilford were we had the opportunity to change directions if need be. 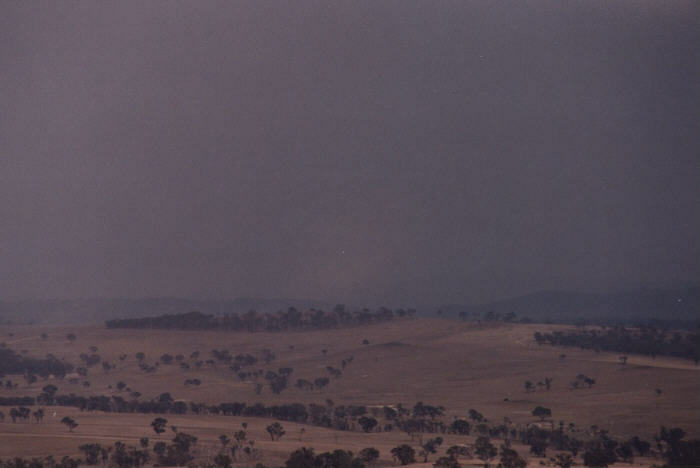 It was really difficult to make out a lot of the distant development that morning due to thick smoke from a fire in the Wollomi National Park that was being drawn into the trough by an easterly wind. It was because of this lack of visibility that Matt decided to phone TWC for a radar update of the developing trough line. 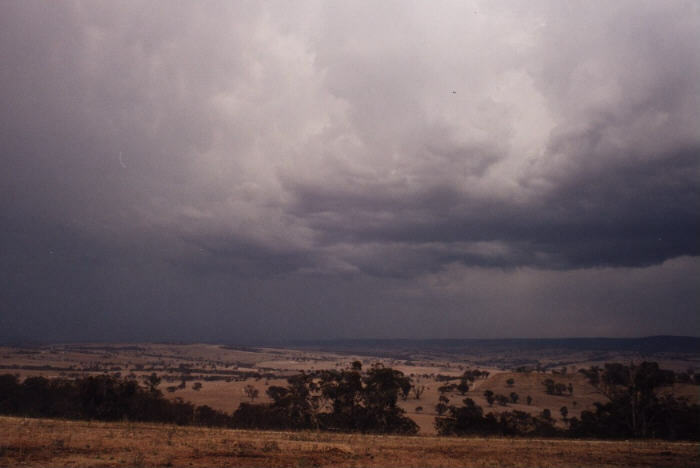 He got hold of Matthew Pearce at TWC who advised him that the better-looking development was back around Bathurst. After Matt got off the phone and explained to situation to me we decided that we would head up the Sofala road to a higher vantage point to make our final decision on which direction to take. There were only three ways from here Bathurst, Mudgee or Lithgow and because of the non-existent road network there would be no going back on our decision. Bathurst was Matthews's choice and I agreed (fingers crossed)!!! 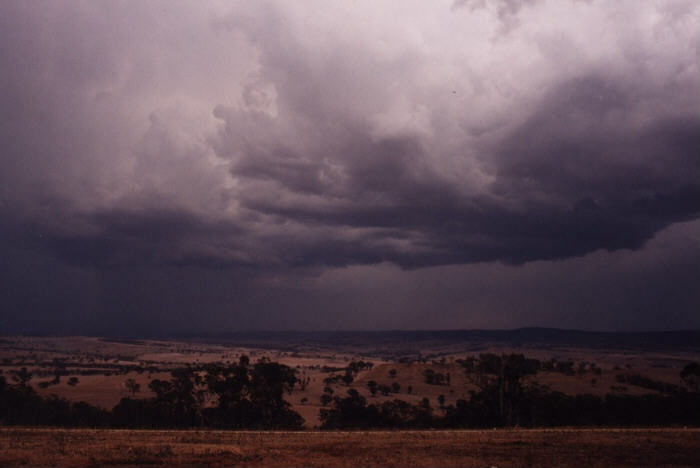 The closer we got to Bathurst the more we realised that we had made the right decision. 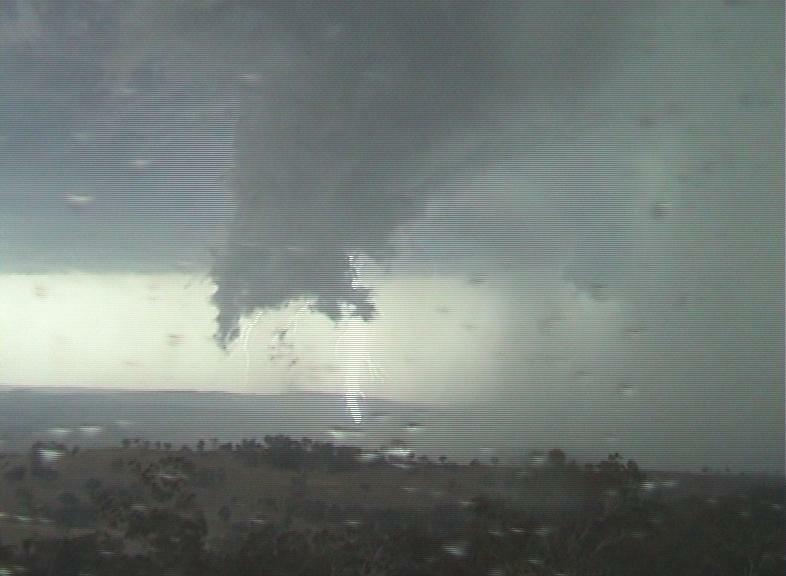 Towers were everywhere, which is not so good if you want supercells, but at least our SDS was in for a fix! 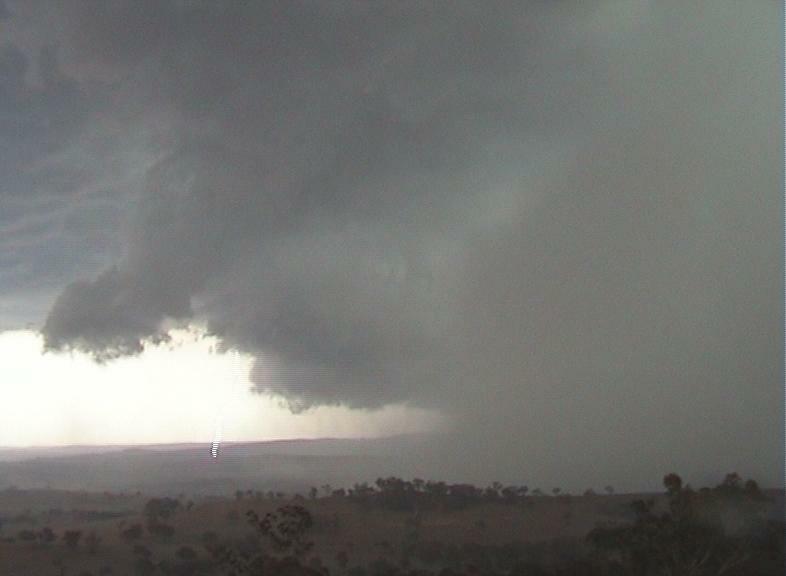 It was at this point that we saw a nice rain free base with a semi circular lowering on the South side of the city. We headed straight to Mt Panorama to get a better view. 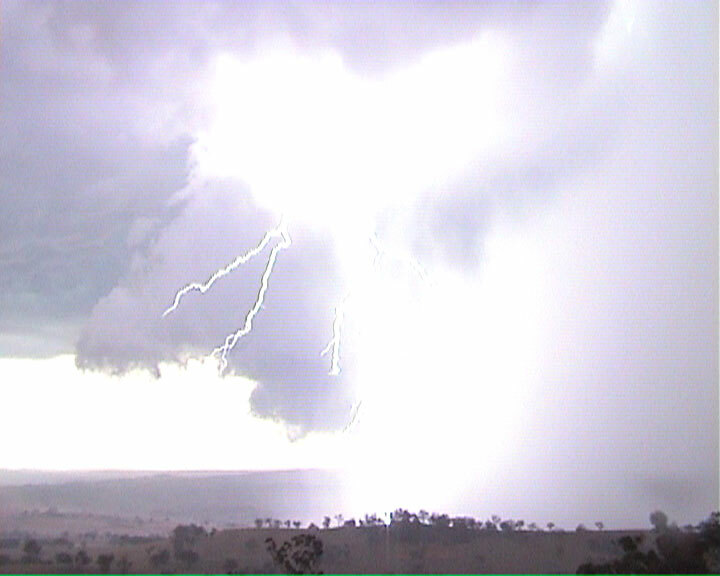 By the time we got there it had dissipated but there were now plenty of storms to watch to our south and south-west. I set up my tripod and started taking pictures hoping to get some lightning shots. Matthew pointed out an area of dust blowing up from a possible microburst to the southwest. 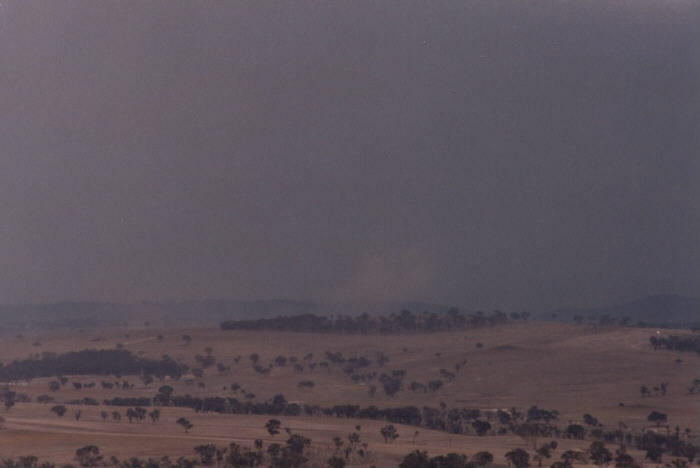 I put a telephoto lens on and got a couple of pics that just show the dust through the haze. 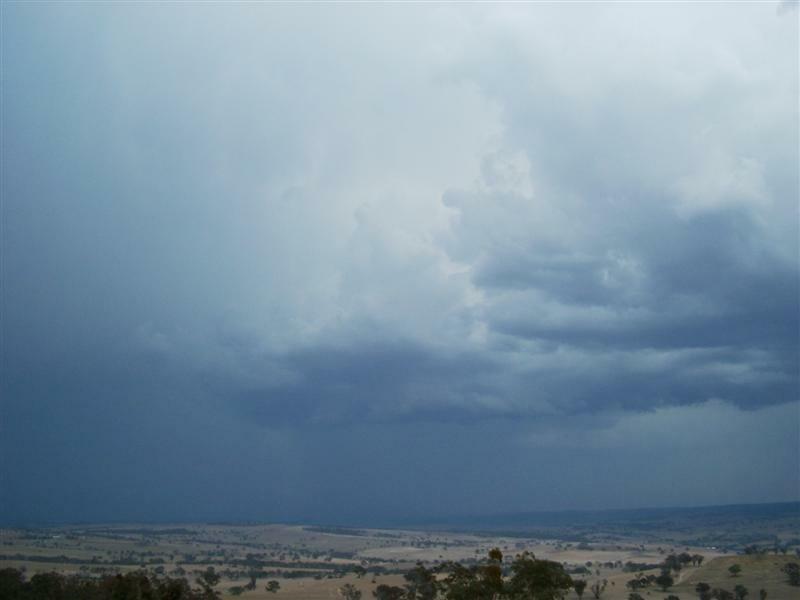 To our west now a rain free base had formed and was tracking in a northerly direction along the ranges west of Bathurst. Matthew had only just mentioned to me that it could do something interesting when it started to drop cg's. The RFB had moved a little further north when precipitation started coming out of the northern side. 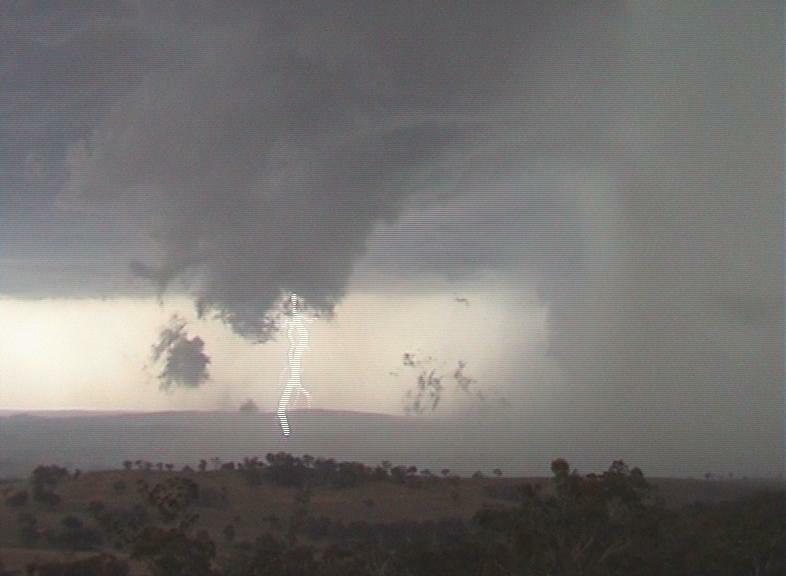 At first it was only a couple of thin black rainshafts, but they soon merged and started to grow. It was at this point that we got the fright that we probably deserved for standing on an exposed mountain next to a thunderstorm. 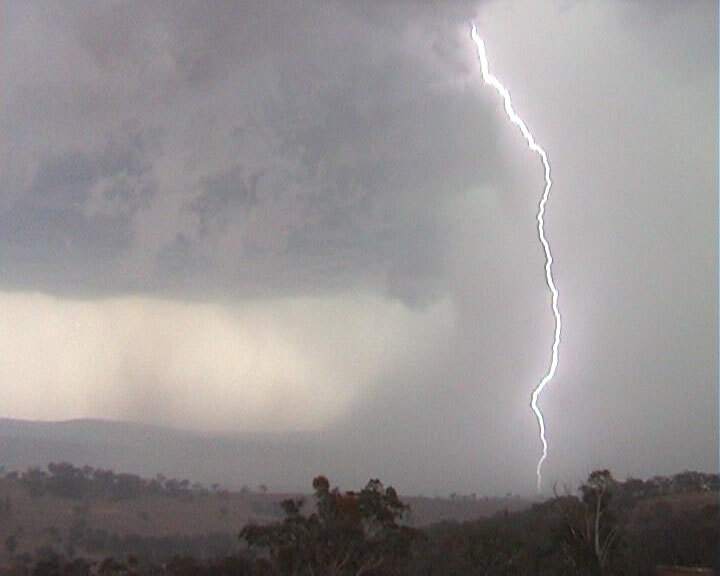 A lightning bolt struck a metal antenna about 30 meters behind us and sent us both diving for the car!!! Talk about a flang!!! 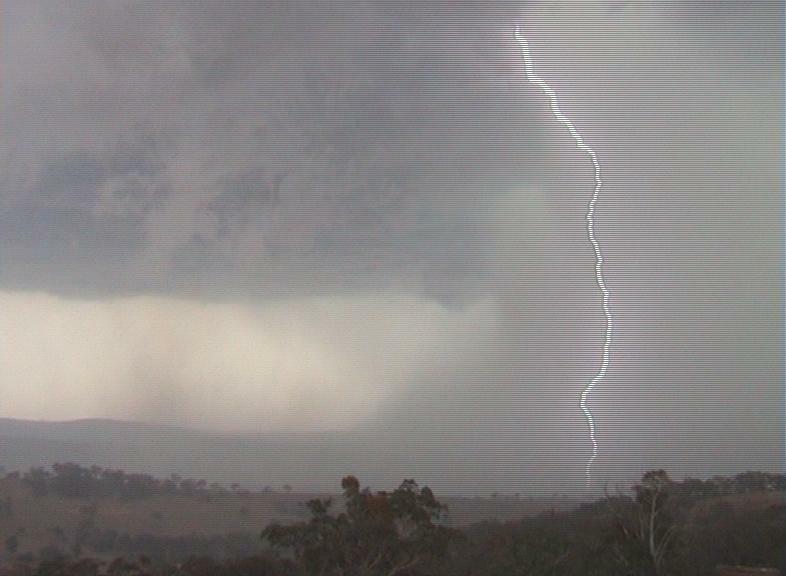 I actually heard the lightning arcing on the metal tower before the whip cracking thunder. 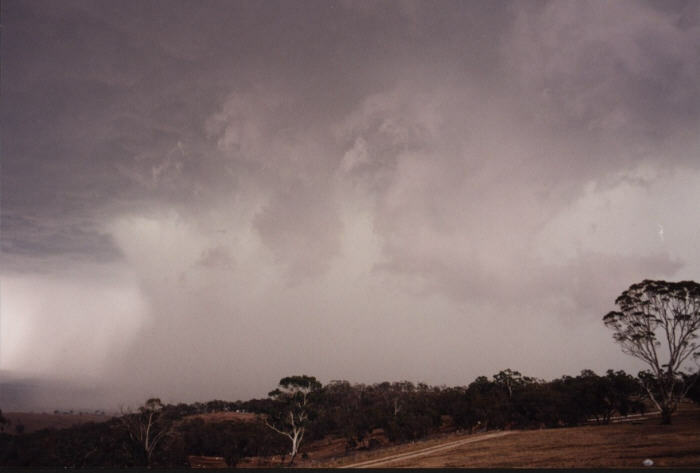 From then on this storm became an in car storm!!! What happened now can only be described as absolutely amazing. 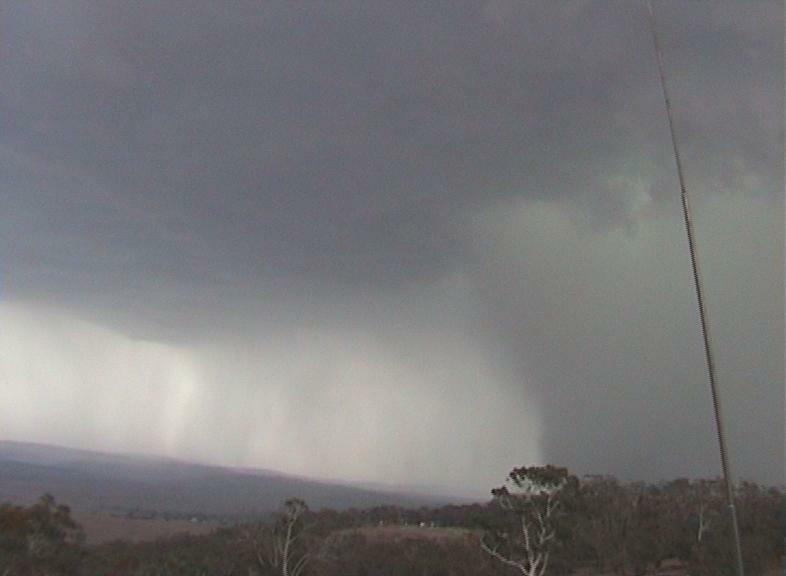 The rainshaft from the developing cell in front of us was now becoming huge! It was intensely black on the western side and it was starting to turn green in the middle and pink on the eastern side, and it was starting to come back towards us. 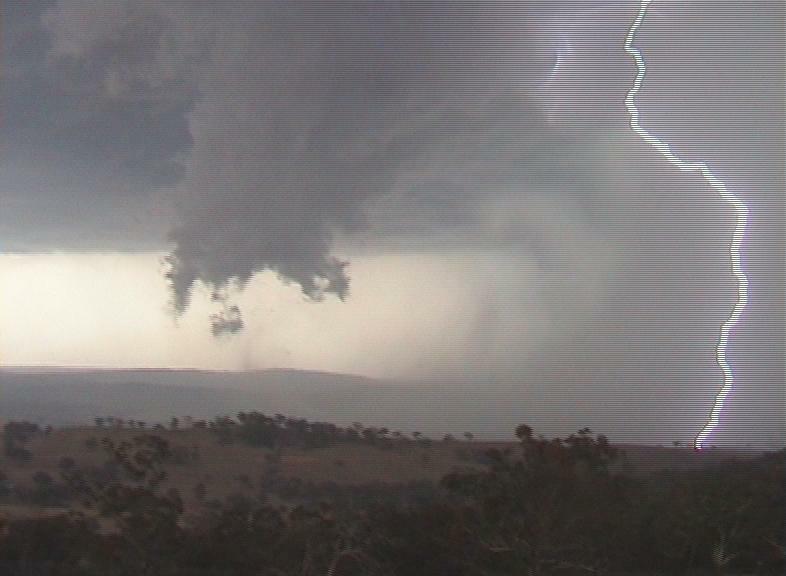 Twenty minutes ago the RFB was heading north and now it had just exploded into a monstrous outflow region the size and colour of which I have never before witnessed. 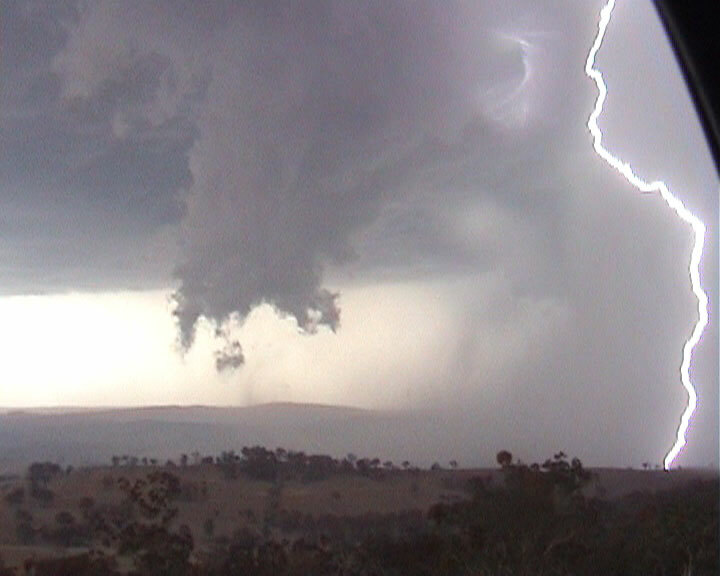 The cell that was building above for long just let go in this amazing display of outflow dominance. 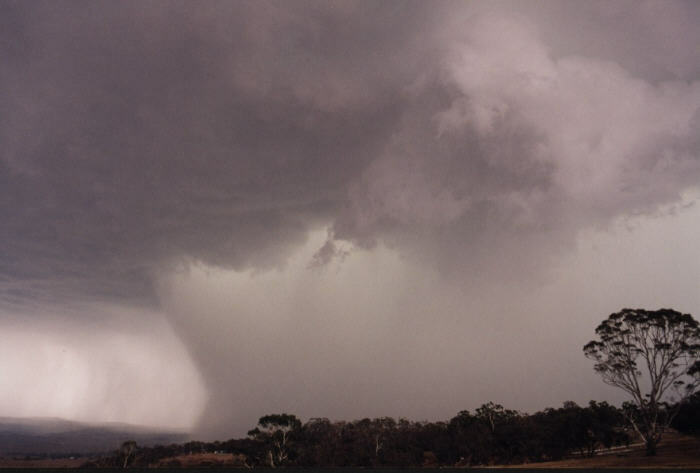 One of the features of this massive outflow dominant storm was some huge wet microbursts which we witnessed coming out of the South Western side. In my photos there are two microburts captured. 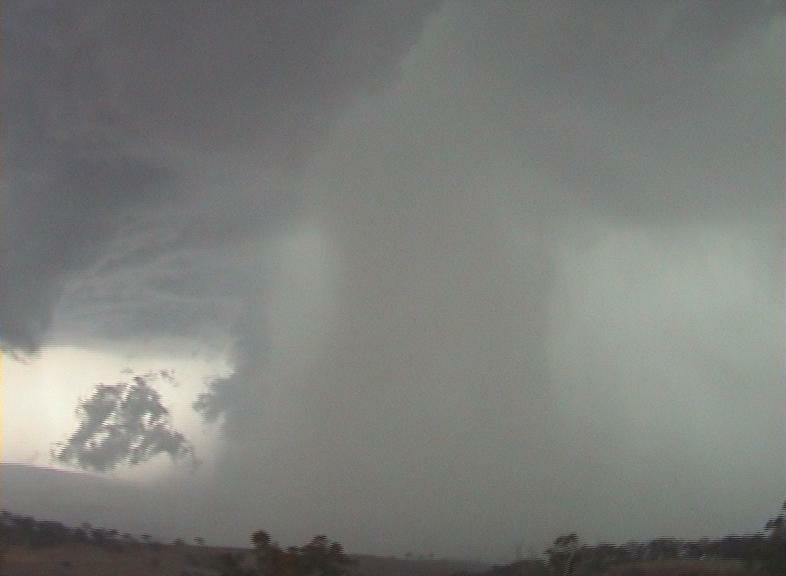 The first one shows a large lump descending down the rear side on the rain shaft. 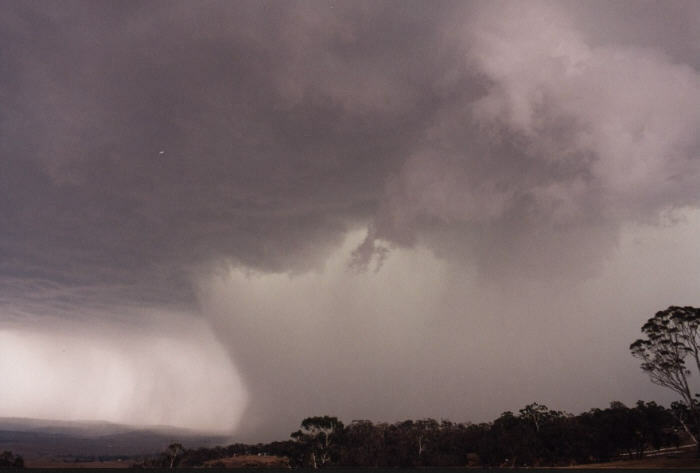 This initial microburst caused a small rainfoot and probably set up the dynamics in the side of the rain shaft that caused its unusual shape. 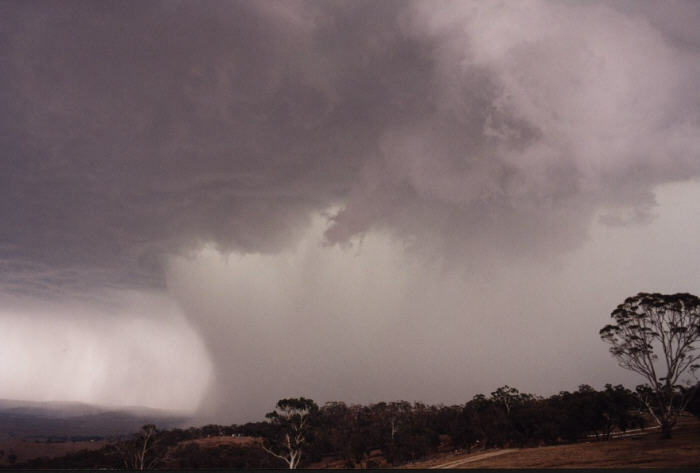 The second Microburst was a lot larger and it came from inside the rainshaft so it wasn't visible at first but it's affect on the rain shaft was, when it blew out the side of the rain shaft completely and created a massive rainfoot. 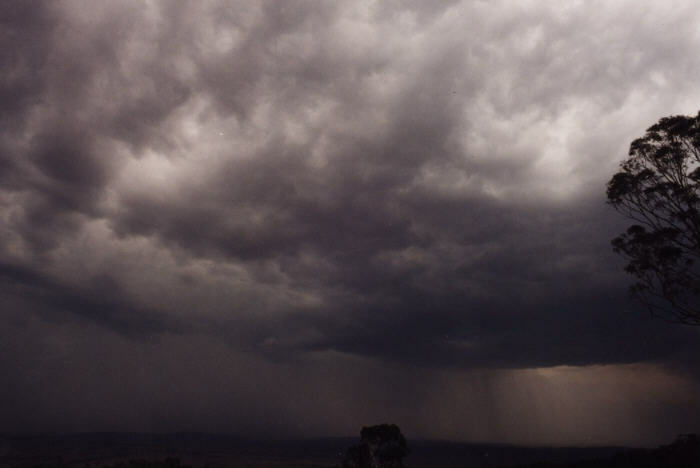 Eventually this second rainfoot started to lift and condense into cloud, which was drawn back into the storm. This cloud then formed an amazing tail type cloud that hung from the cloud base and almost touched the ground at one point! 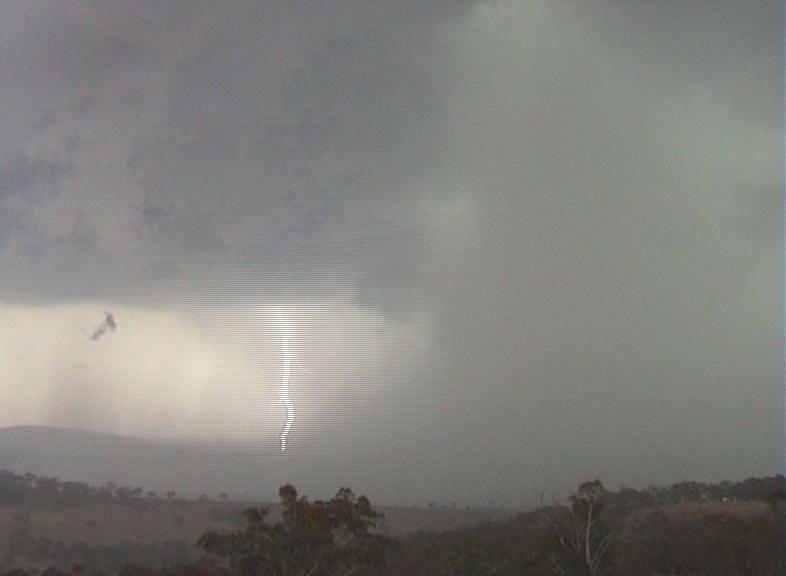 At this point the lightning was incredible with cg's dropping out of the cloud base beside the rain shaft. 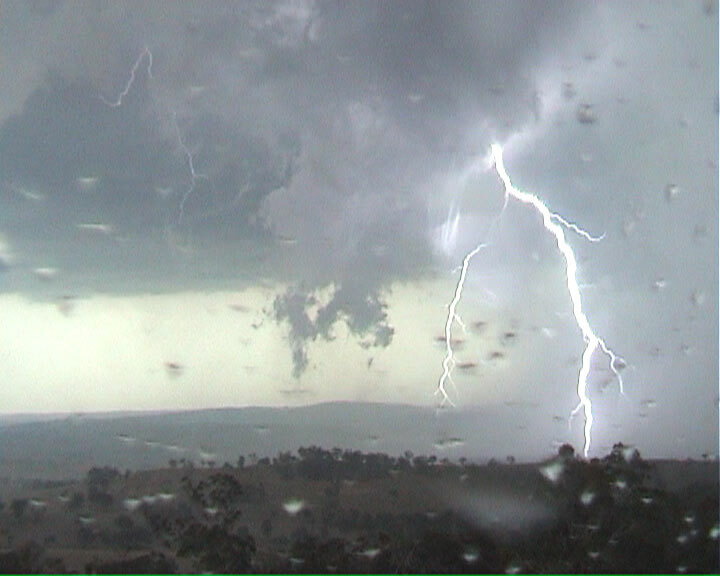 It was a definite severe storm with reported wind gust from Bathurst airport AWS at over 60 knot's during this intense phase. 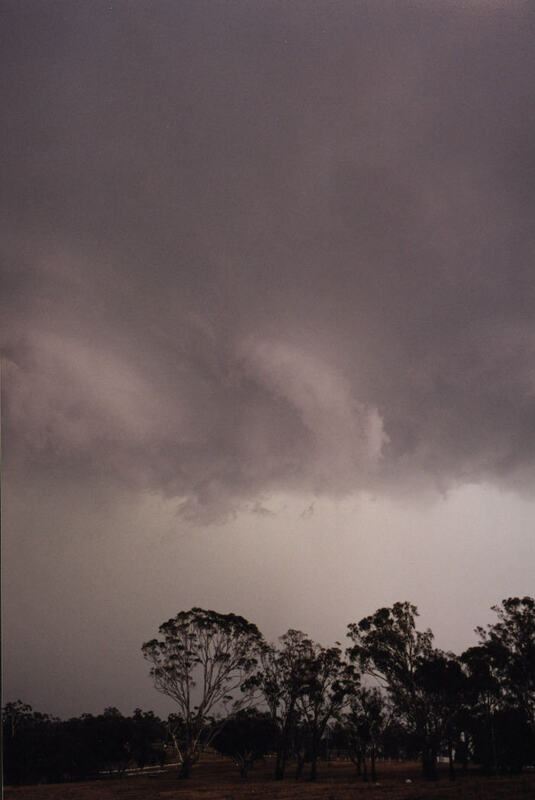 There was also localised flash flooding and wind damage from the microbursts. 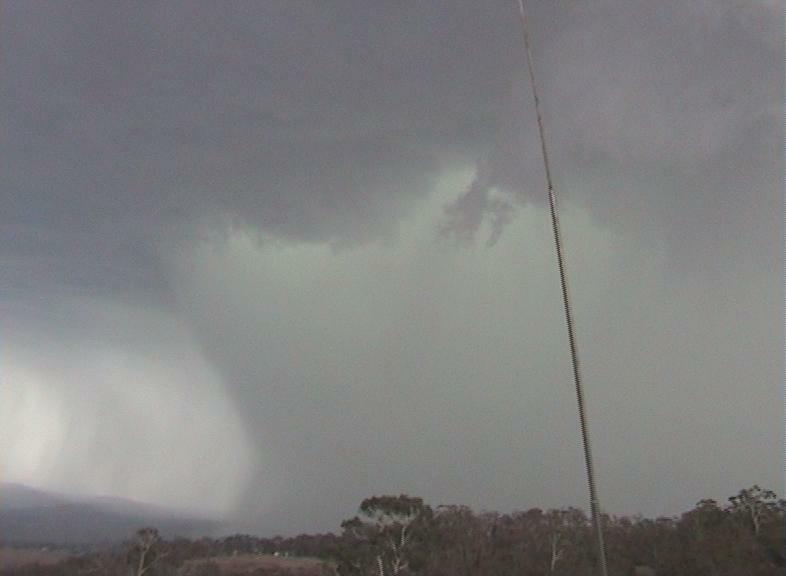 After a further 20 minutes the storm slowly started to look weaker and less impressive, so we decided to try and intercept the core out on the Mid Western Highway before it got to weak in the hope of seeing some falling hail. Unfortunately there was no hail but we saw some minor flash flooding around West Bathurst and we also found some willow trees that had been smashed to pieces by the microbursts, which confirmed what we had seen earlier. We drove further south to Blayney and then east to Newbridge were we found evidence of some extreme flash flooding just out of town. 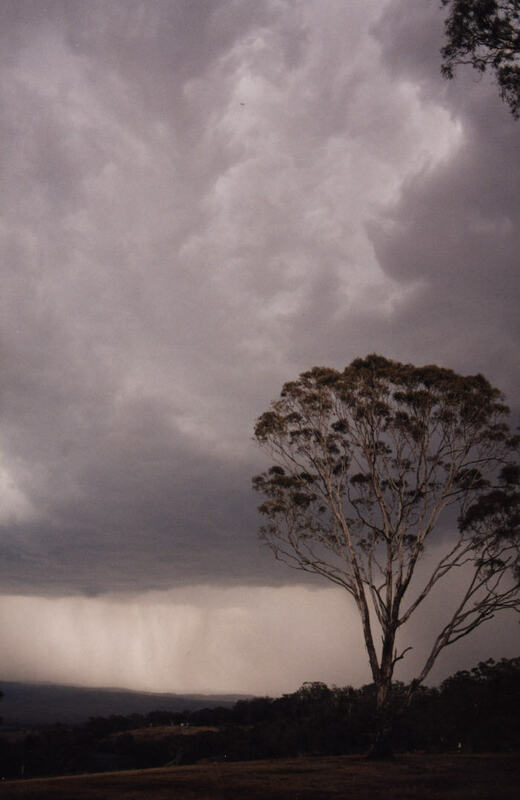 After that we drove back to Bathurst and back into the storm system. 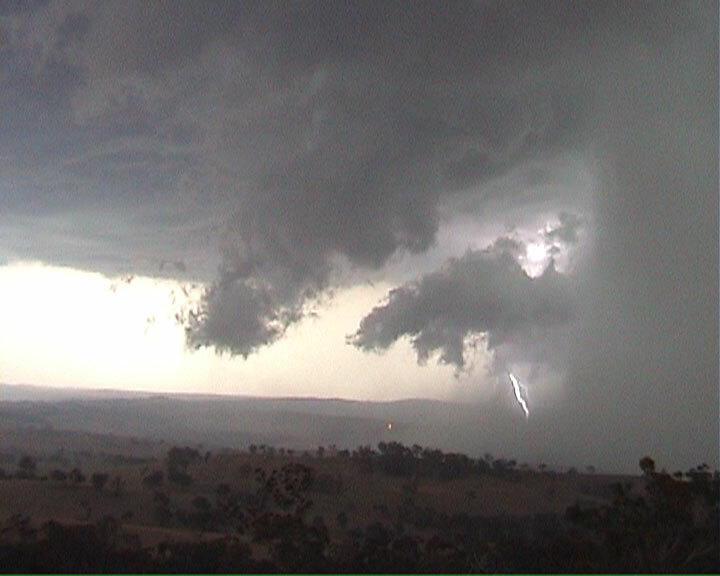 Unfortunately this system basically turned into a thundery rain band after this, which pretty much put an end to our days chasing. We found a service station and filled up. 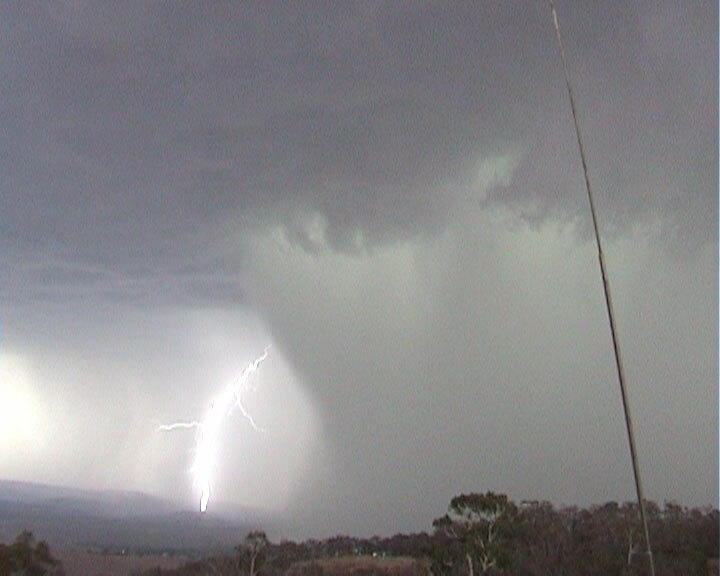 Matthew rang Jimmy for an update and after about 10 minutes discussing the situation we headed south to try and intercept a possible severe storm near Yass, but that's another story..
One of the most amazing things about this storm for me was the view we got from our position on top of Mt.Panorama. It was like sitting in the top row of a stadium and watching the whole thing unfold below like some sort of show. 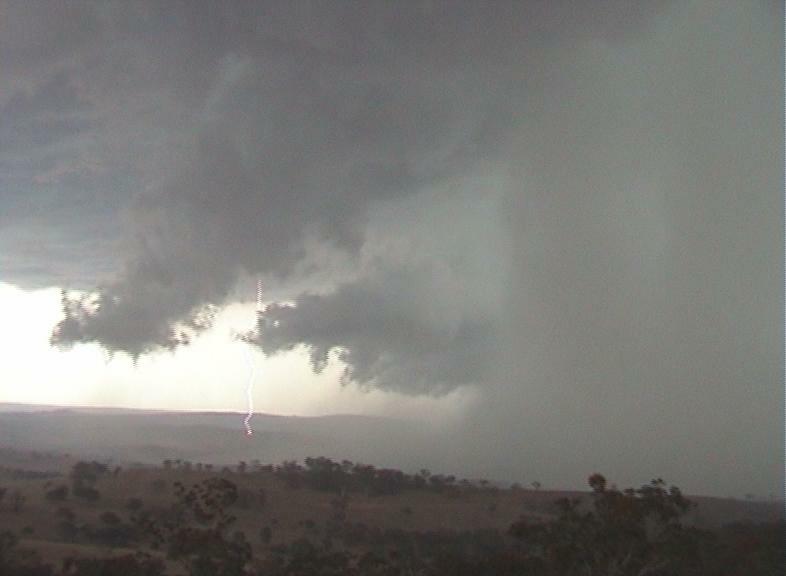 We had a rain free front row seat on an incredible storm that almost blew Bathurst away!!! 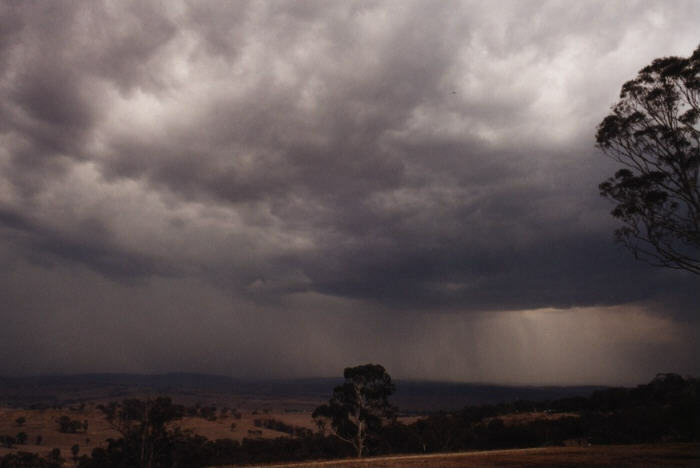 Saturday the 8th February was predicted to provide the best environment for thunderstorms on the Central Tablelands since late 2002. Jeff Brislane and myself were eager to chase this day so we headed out at around 11am to our target area of Mudgee. 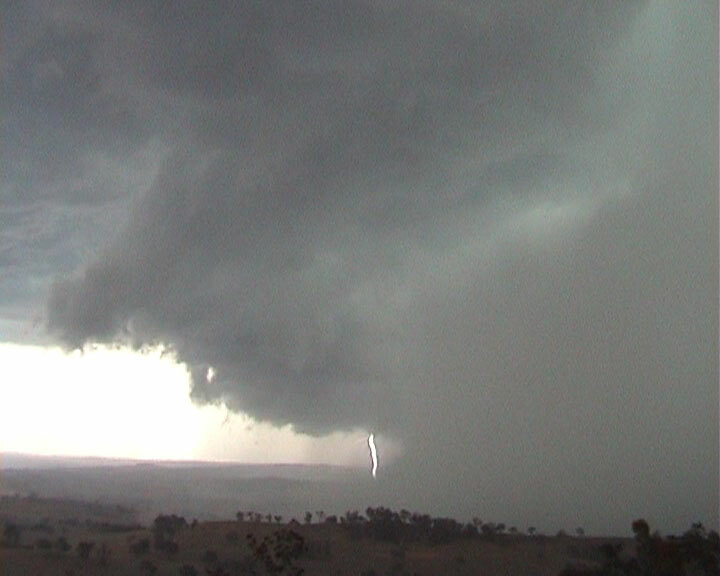 On the way to Mudgee we noticed a rapid build up in TCu to the south towards Bathurst. 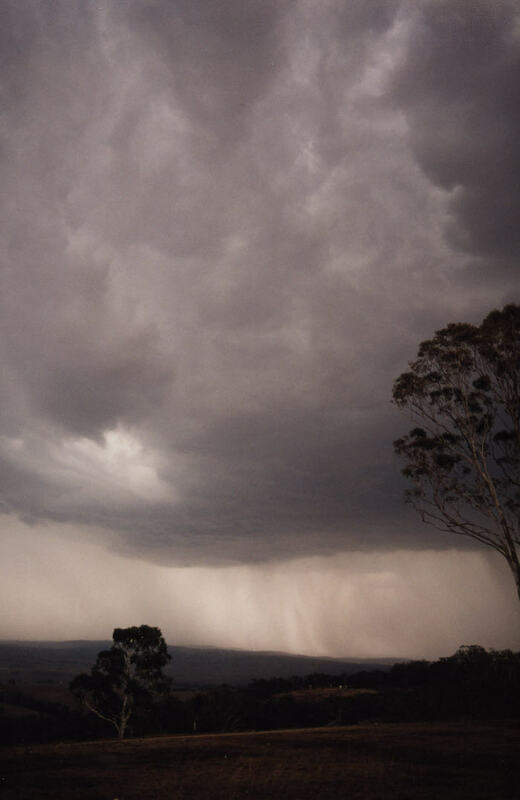 After getting an update on the situation from TWC we decided to head for Bathurst via the Sofala road. 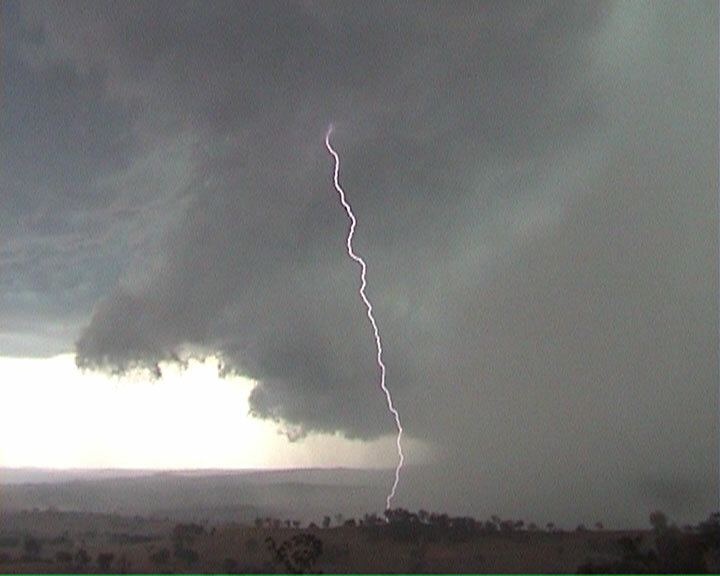 Once to the south of Sofala we encountered the first rain for the day from a weakening anvil. 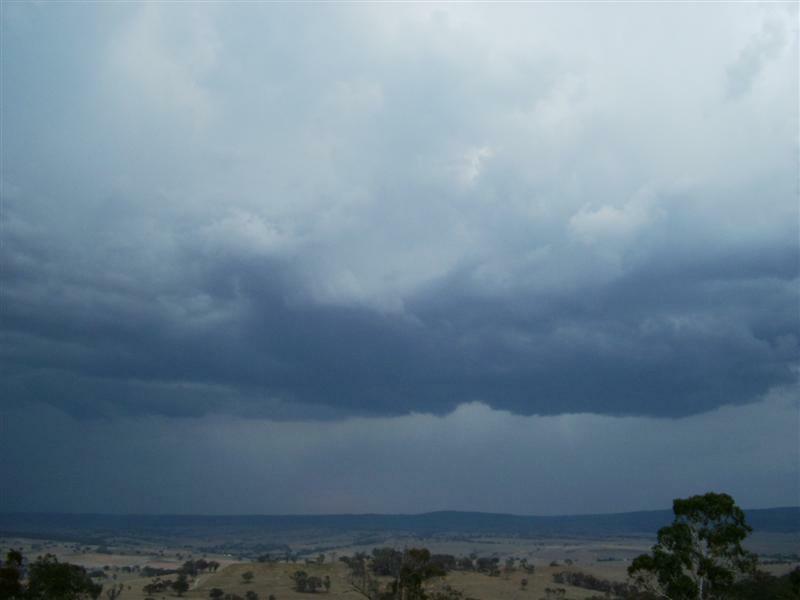 As we approached the northern outskirts of Bathurst we could see what appeared to be a gust-front on a storm to our south. 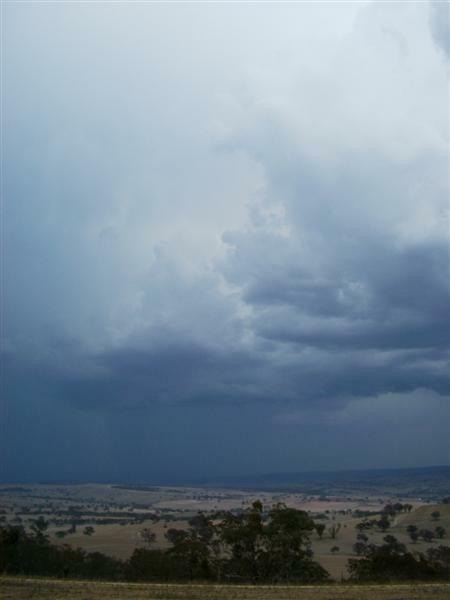 We decided then to head up to the top of Mount Panorama and watch the slowly approaching storms from there. A series of relatively weak storms formed to our south for about the next half hour and it soon became apparent that new storms were progressively developing closer to us. After getting a fright from a CG which dropped nearby we decided to shelter in the car. 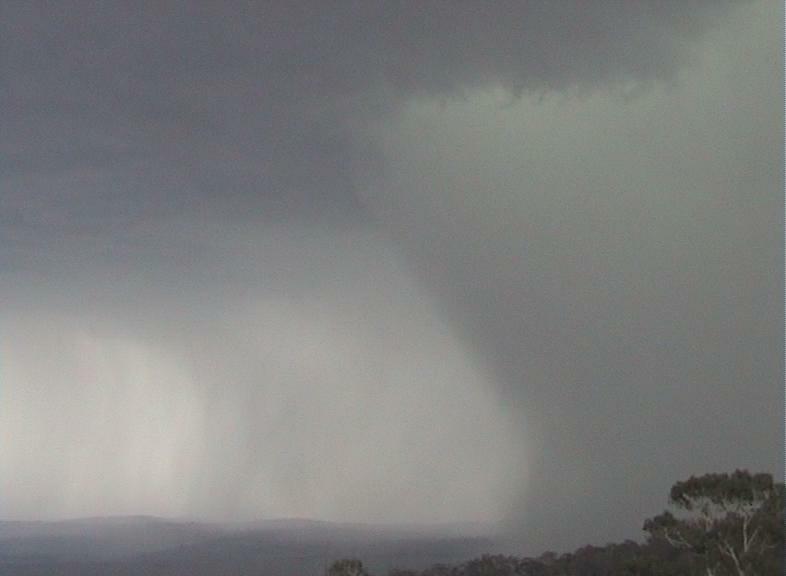 It was only a short time after this that we observed the rapid development of an intense rain shaft. 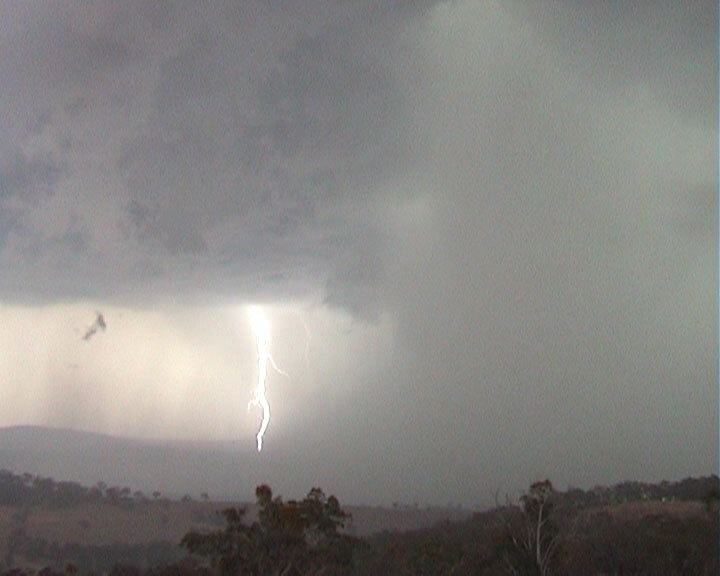 The lightning activity was also picking up considerably and outflow from the storm was creating a spectacular pink tinged gust-front. 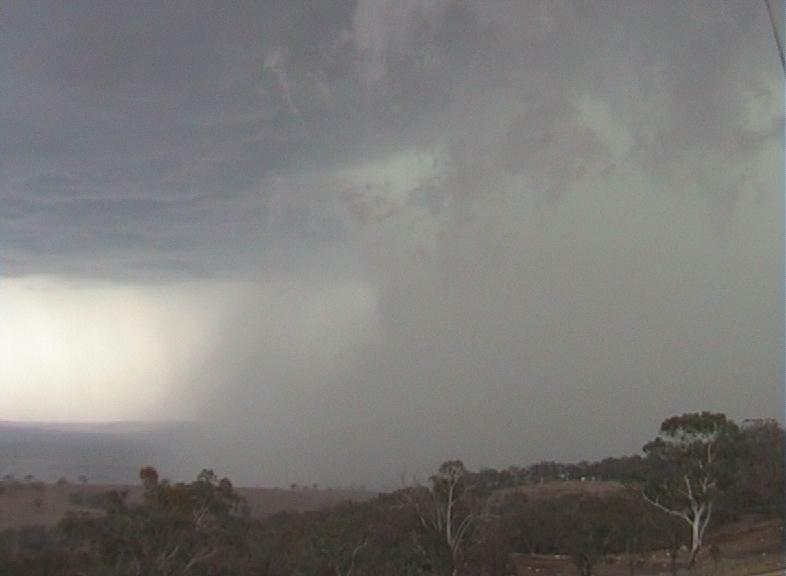 The storm then before our eyes proceeded to let loose a massive wet microburst. The rain quickly spread out a large distance from the storm and eventually we ended up receiving a fine spray of water on our windscreen. 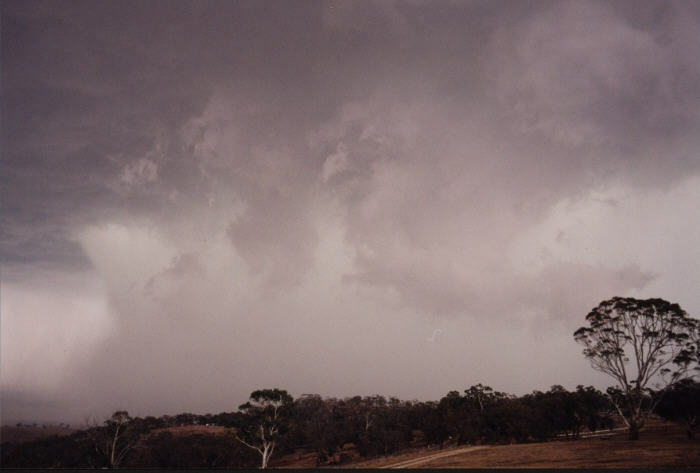 Winds gusting to 65 kts were apparently reported from Bathurst and when we core-punched the remains of the storm later on we observed a number of willow trees which had been severely damaged. 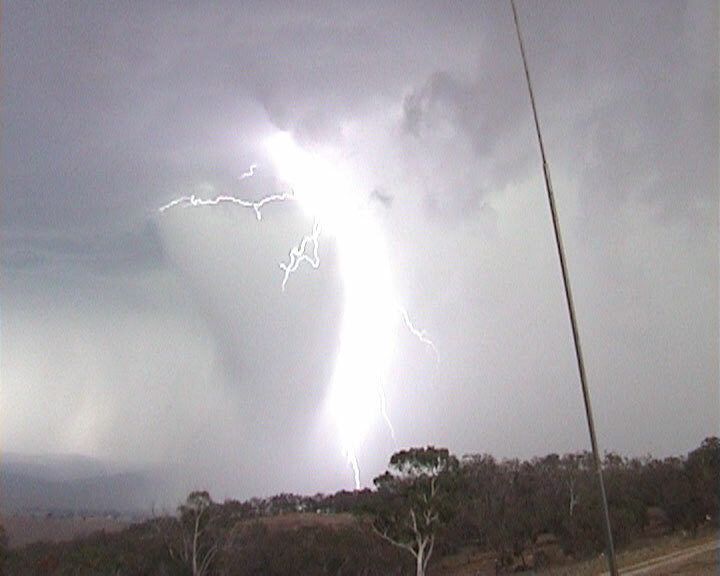 The lightning display from this storm was second to none with Jeff and I being left in sheer awe by natures awesome power. The contrast in colours from this storm were fantastic ranging from an olive green in the main rain shaft to a pink tinge in the cloud along the outflow. 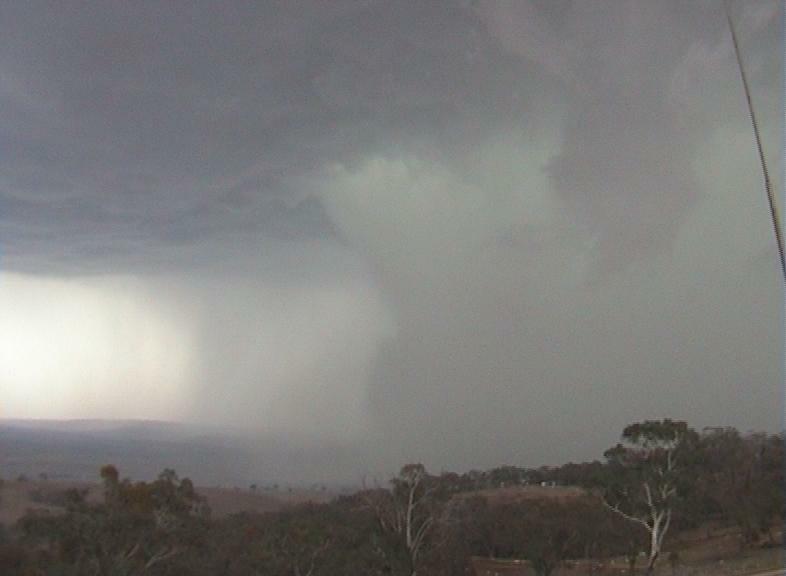 This storm also created widespread flash-flooding in the Bathurst area with 57 mm being recorded at the airport. 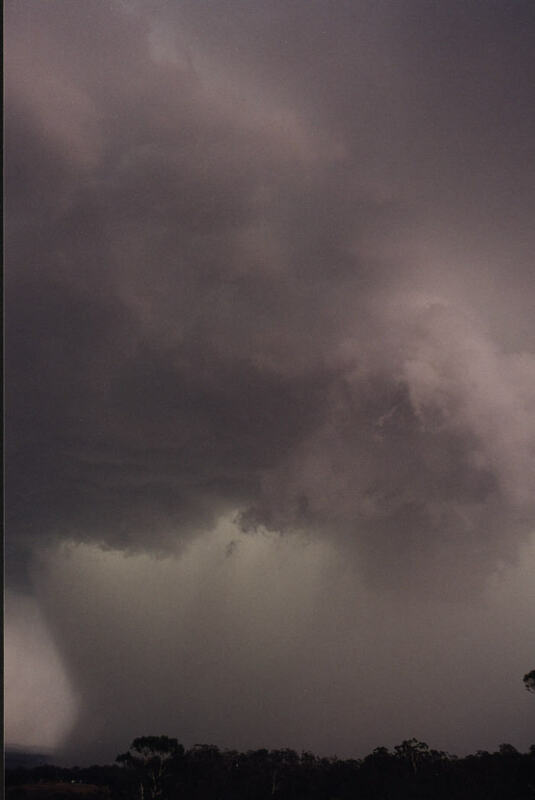 Steering winds on this day were only around 10 kts hence the storms that developed moved along at a snails pace and were ideal for producing flash-flooding. The storms were so slow moving in fact that we were able to come back an hour or so later and the storm was almost in the exact same position we had left it in. 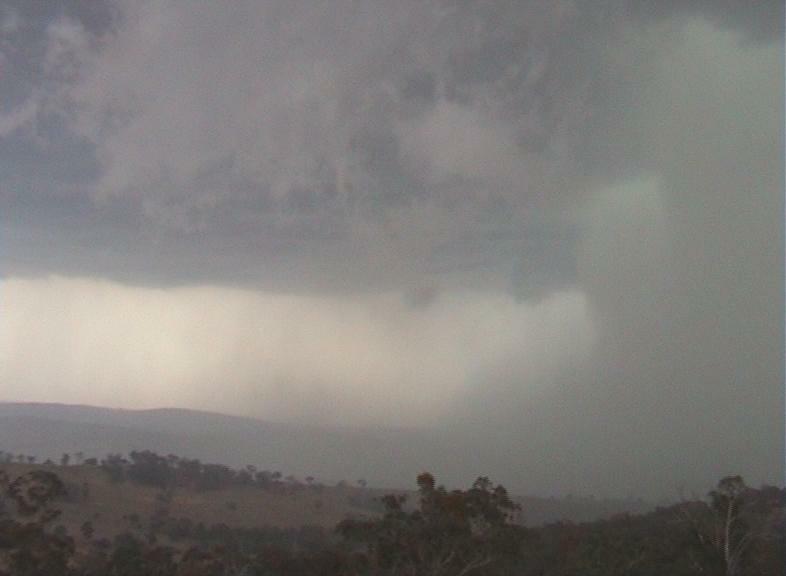 Moisture was abundant throughout all levels of the atmosphere hence the development of hail was hindered. 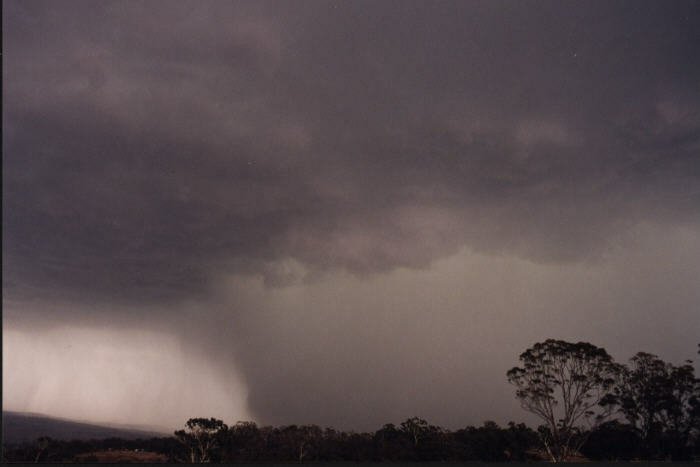 Brief small hail however was observed from the storm in Bathurst and I cannot discount the probability of larger hail falling during the period when the storm was at its most intense. 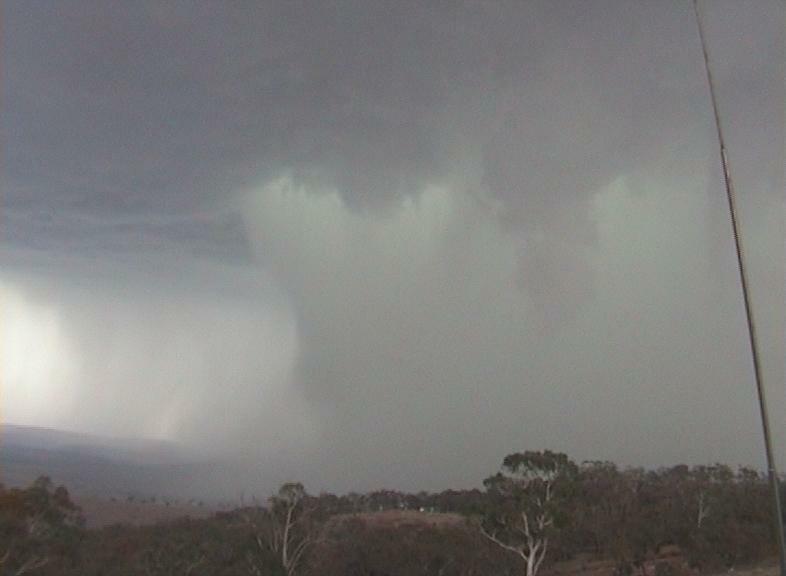 The category of storm that I observed at Bathurst would most closely fit that of a severe multi-cell.